Drawing on his background as both a Door Technician and, well, as an Actor, Barry provides two-part coverage from the booth of ODL at the International Builders’ Show. For Door Glass and their connection to Mid Century aesthetic and further pop culture, immediately below. 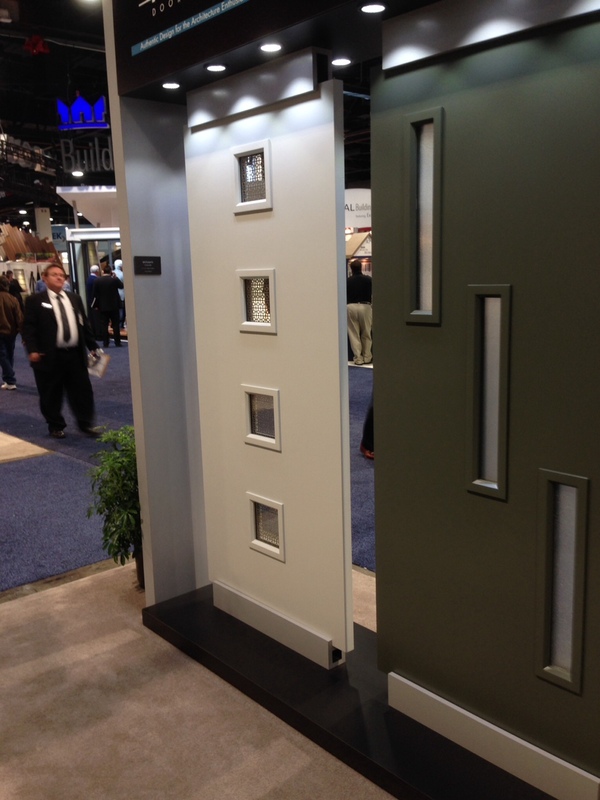 For an intimate look inside Door Manufacturing jump to part one of this article here, ODL Door Glass at IBS. We have covered Door Lite Kits previously as an affordable option to an Exterior Door Replacement. 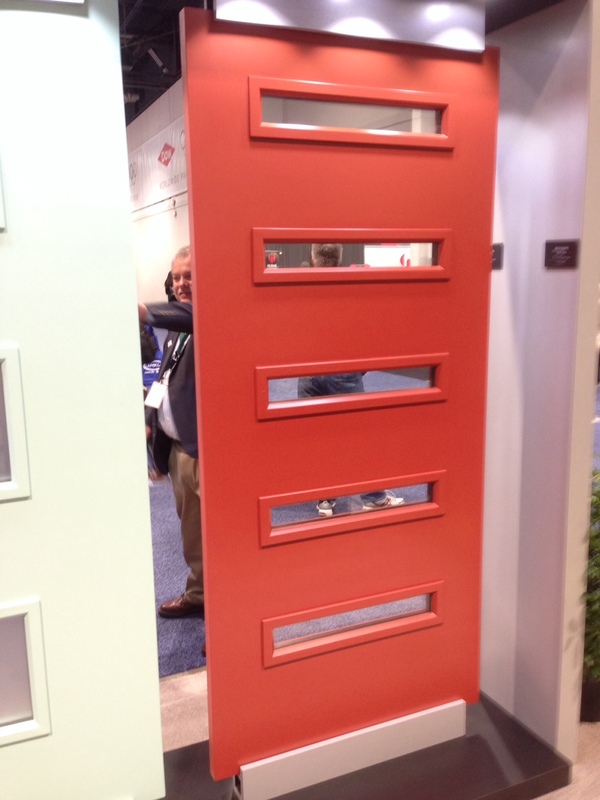 For much more on Exterior Doors, please see our category there. See more from our coverage of Design & Construction Week, here. 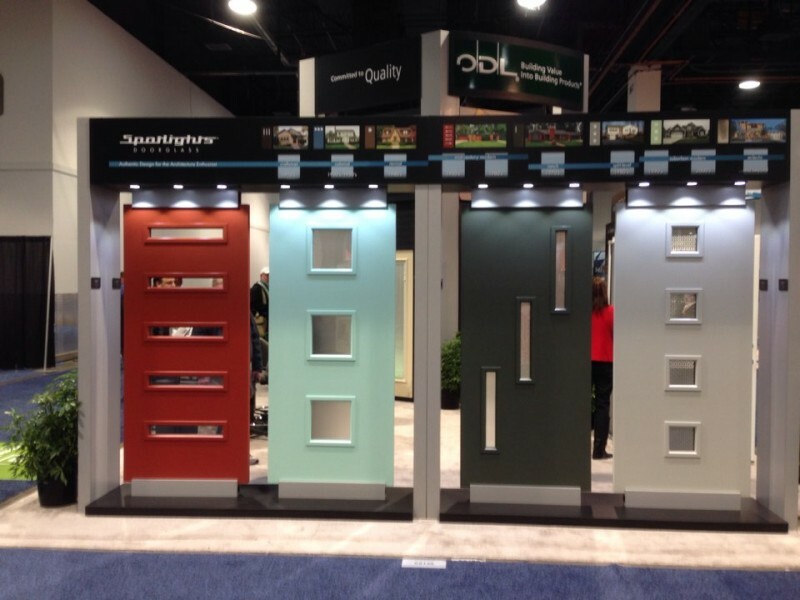 Roger Finch and I walk over to an impressive and fun display of doors which make up one side of the ODL booth at the International Builders’ Show (IBS 2014) in Las Vegas. Roger is a marketing manger at ODL. As he speaks, you can hear how his job overlaps with research and development. 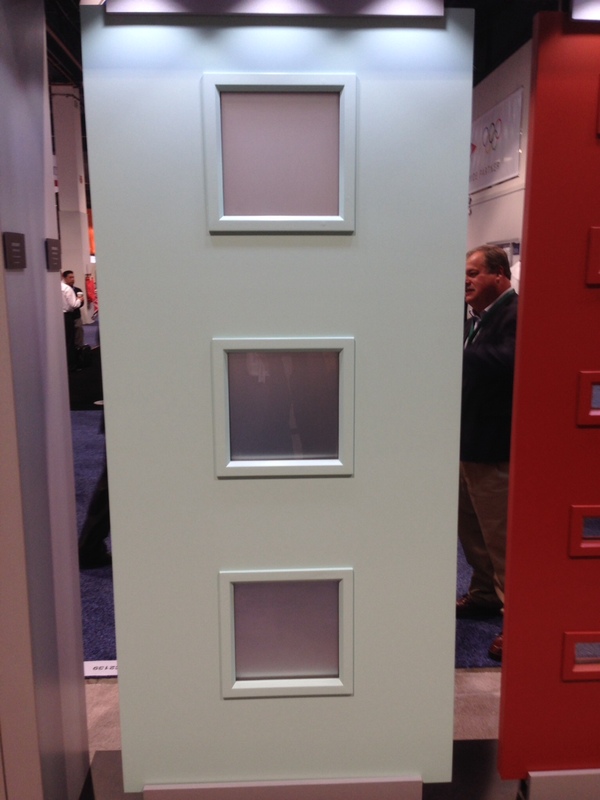 Looking at this array of doors, it is slightly difficult to tell just which “modern” Roger is talking about. Is it the 1960’s idea of modern or is it a more modern, modern? One thing is for certain, the first time I saw this four door display, I immediately thought Brady Bunch. Oddly, when I searched the BB house online I found no windows at all in their front door. 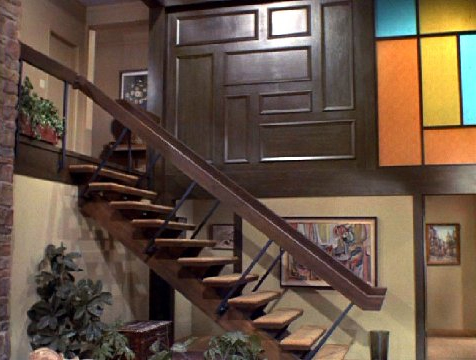 But, Roger was absolutely right nonetheless, these doors do look as though they belong in the Brady home. These Spotlight series door lights have a wonderful quality about them. 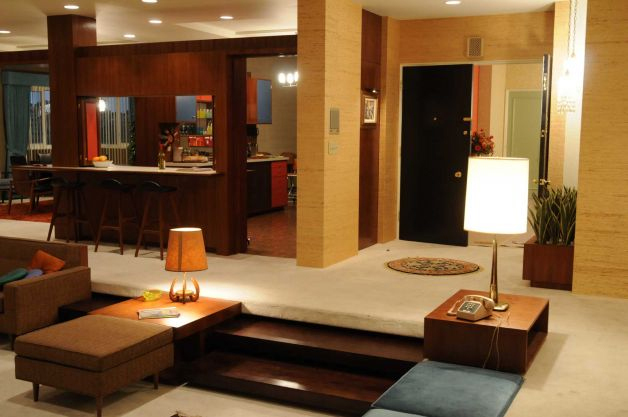 It is an attention to detail that the designers/decorators of the sets from Mad Men may have more to do with driving than any honest-to-goodness sixties TV show. Perhaps due to the look of our moving media from the 1920’s through 1950’s, we Americans created a nostalgia (aka Retro) industry more about visual representation, than about the sensibilities behind the creation and use of an object. In a way, it makes sense – the enduring pop images from those four decades grew directly out of theater and live performance where sets are representational. Silent film had an entirely different personality than talkies. Black and white demanded a different level of detail than did color. When we watch ourselves, in that context, things seem less real then they must have been. Now it is 2014, and the “born in the sixties” kids have high-definition to contend with when telling their stories. I think this how we end up with shows like “Mad Men” and “The Americans” and a sense of the past, which is palpable. 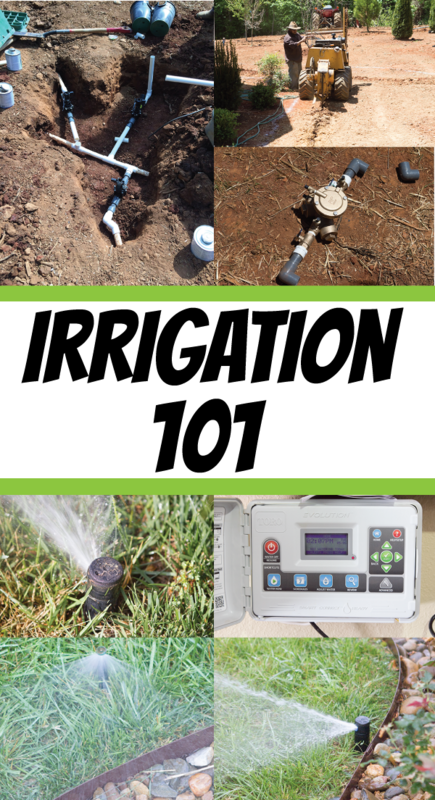 Right down to our entry doors…. Thank so Roger Finch for allowing me to record this interview. The Spotlight series is visually striking in its own right, but, for me, it strikes a larger chord as well. 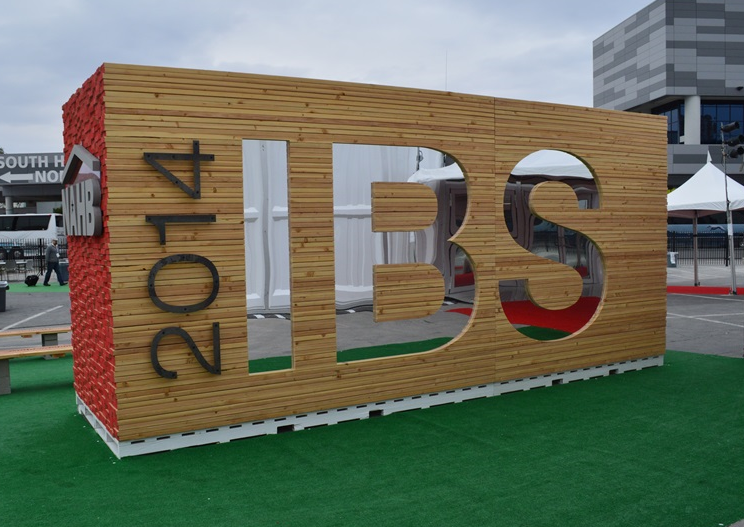 A chord that seemed to resound throughout IBS this year. Everywhere I looked, through color choice, style, product quality and even innovation – it seemed like “Retro” was evolving to take itself, well, seriously. No longer consigned to simply evoking a feeling, the concepts of “retro” and “nostalgia” seem to be back to the American table of ideas. You can find out more information about the Spotlights series door glass by downloading this press release from ODL’s site, or by talking with your local Jeld-Wen dealer. When I was a younger man, I briefly worked at a surplus door and window store in Georgetown, DE. I was hired as a fixer and was assigned a back room full of broken and bruised doors to repair. For three months, I used my wits, Bondo, glue and paint to cure or cover up a myriad of problems with these doors. The doors were mostly pre-hung exterior, from a variety of makers. Every few days new patients would arrive. Some were budget doors at the outset. Others were the top of their manufacturer’s lines. But most all had one thing in common. Looking beyond the defects which landed them on my table. Upon close inspection of the manufacturing of the door, most appeared to be poorly constructed. Staples, shot hastily from a gun were blown out, fired on top of each other or not set and jambs were often not the same size. It could be argued that these doors were seconds from the start. After leaving this job, I continued to take a good look at each pre-hung door I found/find in front of me. More often than not their manufacture appeared rough or shoddy as well. I chocked it up to the building boom and the speed with which folks had to work in the factories. 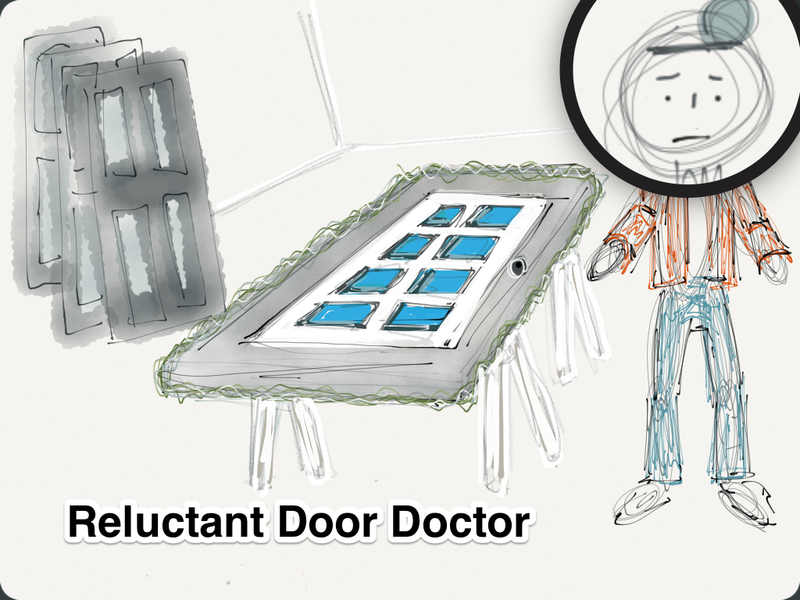 For years, I have had a very low opinion of the quality of pre-hung doors. It is hard to let go of a conception like this. Once it has taken hold and I believe that I may have been blind to a renaissance of quality in pre-hung door manufacture over the last few years. 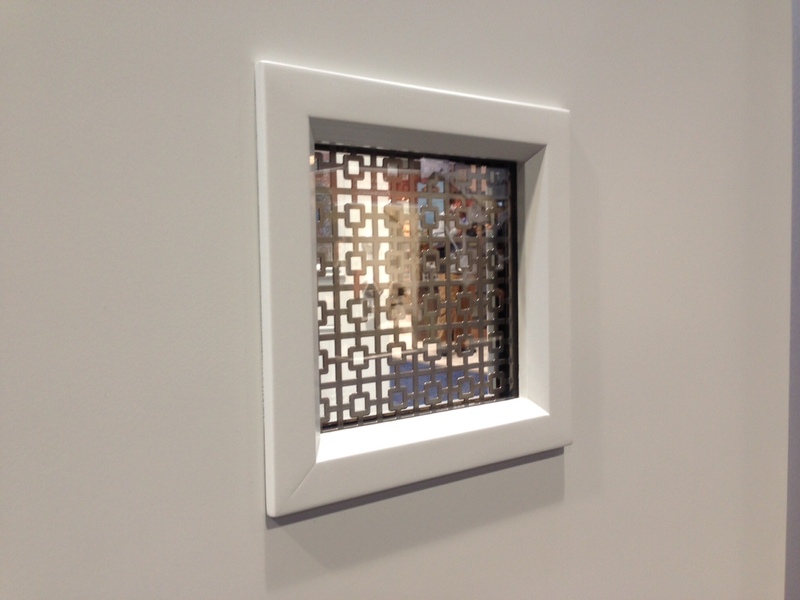 Fortunately, the 2014 International Builders’ Show helped me see things in a different light. 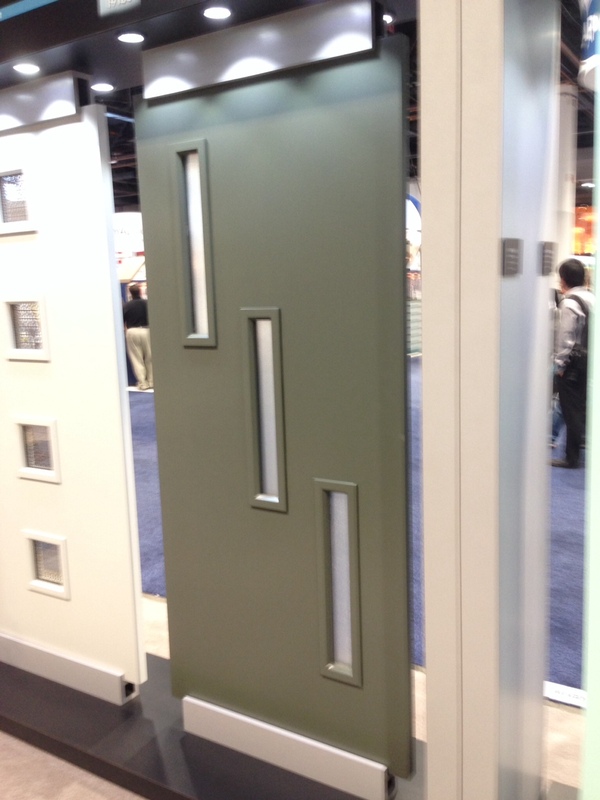 Currently they supply the door manufacturer Jeld-Wen with door lights. At IBS, I met Roger Finch, who is the Distribution Channel Marketing Manager at ODL, and according to his LinkedIn profile, is “responsible for all marketing activities to the distribution channel, new product launches, product line extensions and introductions.” Roger is also a genuinely nice person and knows a lot about his company’s products. He began by teaching me about Evolve, a newly designed door light frame the company introduced in early 2013. “What were they previously?” I asked. Now, you have probably figured out that a “screw boss” is the Male and Female part on either side of the frame. 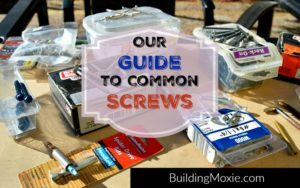 This is the point through which the screw passes to hold the two sides tightly together. When these are too far apart, there is not enough holding power on the frame and midway between the bosses. The center area tends to rise in a phenomena known to the door industry as “Scalloping“. 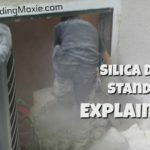 “Depending on the frame manufacturer,” Roger said, “you can get scalloping as deep as the depth of a dime.” When the corner of a frame rises due to misplaced pressure, this is known as “Flare“. 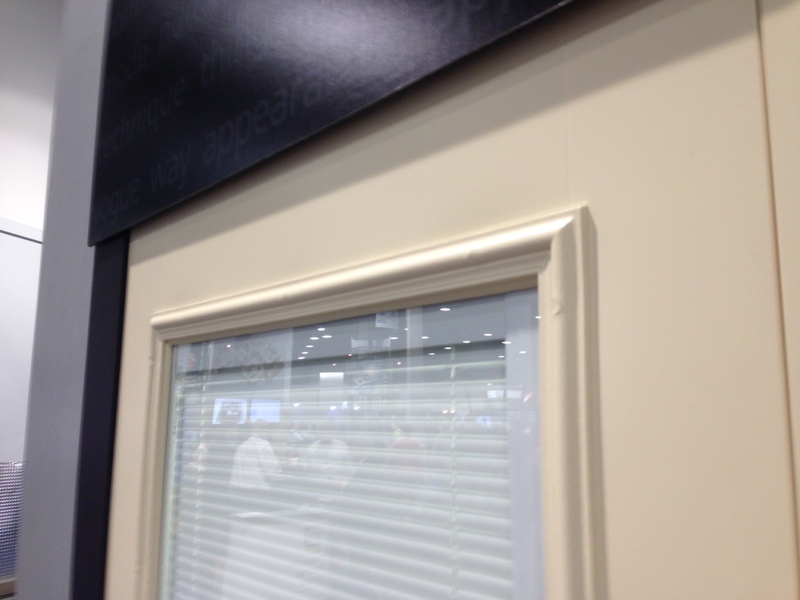 If you had to remove the Evolve frame, you would do so the same as a caulked insert. 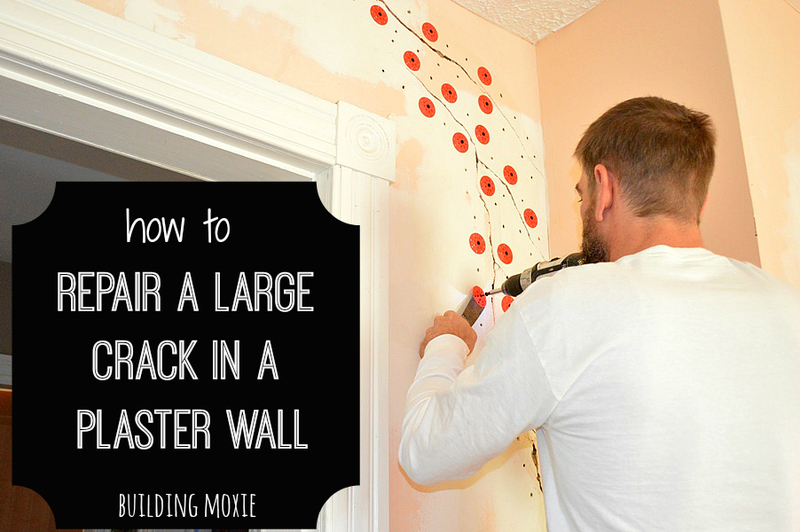 Once out, you would remove the sealant tape and replace it with one provided free-of-charge by the manufacturer. “You can call ODL at our 800 number and we’ll send it out at no charge.” Roger said. I looked up the Evolve frame online. I learned that integrated into the new screw-boss design is a structural rib intended to bolster the frame further. Evolve it seems is aptly named. You can download a PDF file about the Evolve frame HERE.